Want to inject a bit of fun into your holiday? Looking for ways to wind down after a long day of touring? “Boules & Wine” is a nice, fun way to relax. Boules is very popular with Parisians because everyone has a chance to win. And wine is a nice plus. Your boules instructor meets you on Paris’ oldest bridge, Pont-Neuf. The instructor helps you into an invisible Parisian paradise: Place Dauphine. 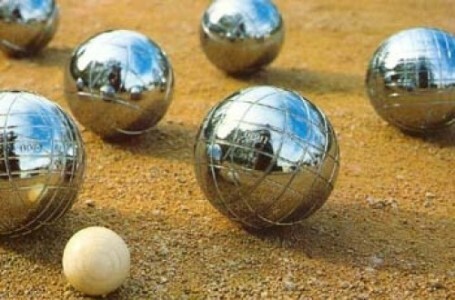 It takes the instructor but 2 minutes to show you the basics of “boules” – the steel balls also known as “pétanque”. The game can start. You choose your strategy. You can score, you can block the other team. But for everyone, experience is not so important. You need self-control – and a bit of luck. The instructor will slip good tips, and show some tricks. She will also tell the history of the game. And the fun ways you can win. As Parisians say: the important thing here is to play, not to win. Of course, the instructor will bring some drinks and French snacks, it’s also part of the game. At the end, well… everyone feels they’ve won! And that’s what boules & wine is all about. Come as you are. Wear comfortable shoes if you’d like. We provide the rest. Our Paris Boule game plays at 5.30pm every Friday. 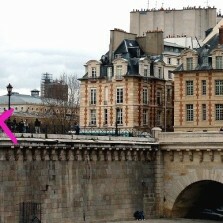 We meet in the middle of “pont-neuf” bridge, by the horse statue. Closest metro stations are Pont-neuf (line 7) and Cité (line 4). The Paris Boule Game ends where it starts, near metro Pont-Neuf. Because we all want some fun every now and then. And because Boules is also so authentic. Tour is €29/adult (or US$32) discounted to €13 for kids 17 and under. Children under 7 come for free. this tour includes: instructor, playing gear, 2 drinks/person. it does not include: gratuity for guide (optional), hotel pick-up or drop-off.